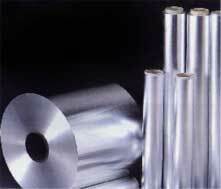 Our aluminum foil consumers utilize this product for packaging enclosures, insulation, aluminum connectors, medical products and lamination processes among various other applications. Made from this metal, the first phonograph cylinders produced audio recordings. Available Gauges: .0001" to .008"
Available Widths: Full 12" to 48" mill widths or custom slit from .125" and above at a tolerance of (+/-.005). Camber maximum .500" in any 72" portion.